Spiralized vegetables as a replacement for pasta is a healthy choice, and simple to do with a Spiralizer. One of my husband’s favorite vegetables is zucchini, so spiralized zucchini is naturally a hit for us (and a dish that even he can tackle). Zucchini pasta is versatile like regular pasta and can be cooked many different ways. I personally have cooked zucchini with marinara sauce or pasta sauce, with a garlic sauce and even as a stir-fry with other green vegetables. For this recipe, I decided to cook the zucchini pasta with brussel sprouts, pine nuts and bread crumbs. I simply saute the bread crumbs in olive oil and garlic, easy-peasy. To get a nice charred color on the Brussels sprouts I just roasted them in the oven. You may skip this step though if you want to prepare the meal in a quicker manner as it’s completely optional. This is a lighter menu option for those of you on a health-kick recipe. This zucchini pasta would be perfect for meatless Monday. 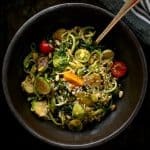 You may also use a traditional spaghetti pasta for this recipe and stir in the brussels sprouts with pancetta to boost the flavor as these taste great whether or not you have them with spiralized zucchini. Eating more veggies and less carbs is something that many people dread doing, but with some tricks of the trade, a handful of menu ideas and a few easy kitchen toolsyou’ll be on your way. I still love my pasta but with my husband we’ve had to make some adjustments (at least to his meals), but it has been a fun adventure with some great tasting food. In a medium skillet over medium-high heat, heat up the oil then add garlic and shallots. Cool until fragrant. Stir in the brussels sprouts and cook until they soften (for about 2-3 minutes). 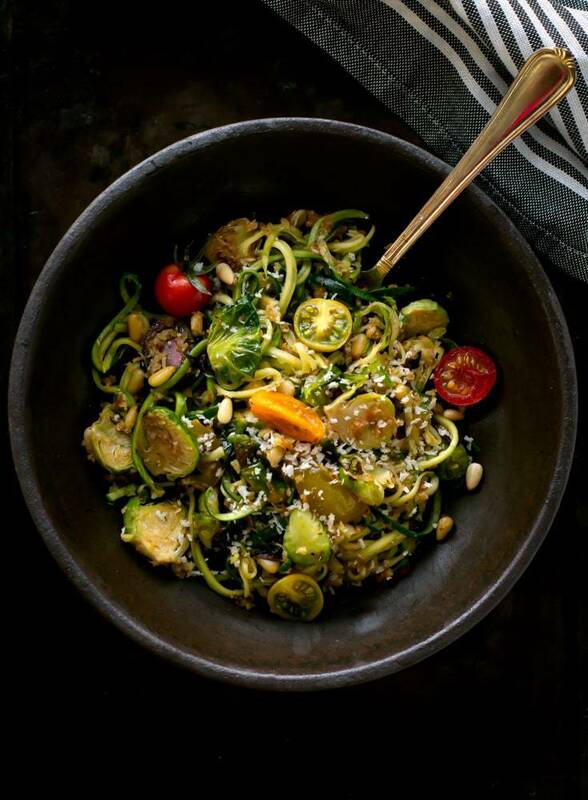 Spiralize zucchini noodles and add them to skillet, then season with salt/pepper and cook until softened. I have got to get a spiralizer so I can make your delicious looking pasta. I know they have been all the rage for a while and rightly so. This recipe has all my favorites and I’m looking forward to making it. My friend just bought that spiralizer unit and loves it–I will send this to her as she is a great cook and can make it for us! If I hadn’t seen the picture I would have said no thanks to this meal. The visual alone makes me open up my mind and my taste buds. This zucchini pasta looks incredible. This is such a beautiful and healthy dish! I love all of those ingredients and it fits in perfectly with my diet! Thanks for sharing, I can’t wait to try it! I love this dish! It looks so beautiful with all the bright colors of the vegetables. i’d love to buy a spiralizer! I’ve heard good things about it. I have been trying to eat fewer carbs and more veggies. This looks like it would taste so good I wouldn’t miss the noodles. This might seem “too healthy” for my sons because you know how kids are, but I can’t turn my back on this recipe because it’s my kind of lunch! It looks so good and fresh! You simply cannot say no to zucchini pasta! I am always looking for something that is healthy. It looks like a great lunch for me each day. Simple to make and I know I would love it. I am so picky! I’m not much on tomatoes or brussel sprouts. But, it seems like we wouldn’t really taste the sprouts and I can make it without the tomatoes. sprouts aren’t strong tasting, are they??? Thanks for sharing! 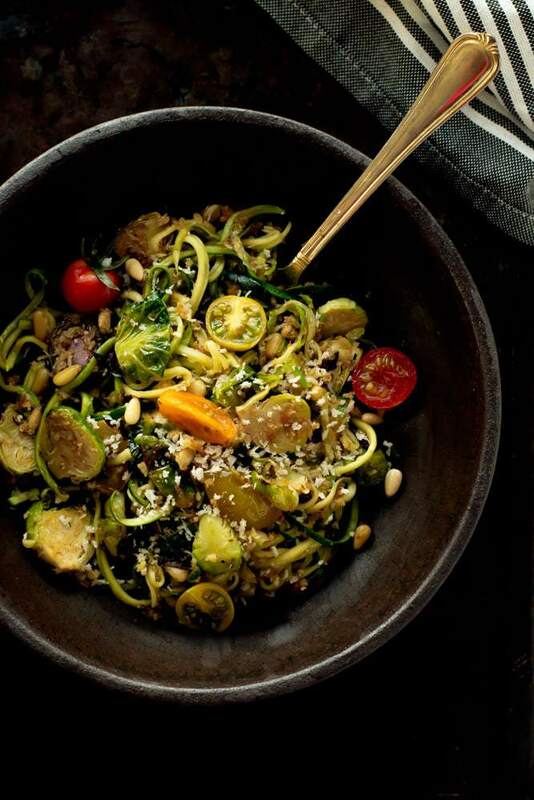 That Zucchini Pasta with Brussel Sprout, Pine Nuts and Bread Crumbs looks super yummy! I’ve really been wanting to add more Zucchinis to my diet so this recipe is right up my alley. This is an interesting combination of items, I will have to try to make this because I do love brussel sprouts. 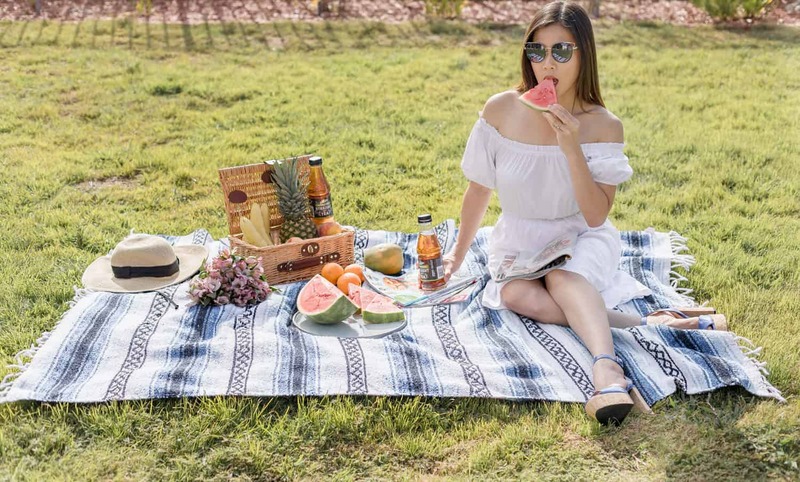 I bought a spirlizer at the beginning of this past summer and we LOVED it! My kids LOVE to spiral zucchinis! This looks like a very tasty dish. All the food you are cooking are super healthy, it is very inspiring. If I were the only one to decide of what we eat, I would prefer veggies everyday. I have always wanted to get one of the machines to make this type of zucchini spirals like that. I love your recipe, looks great. That looks delicious! I have been meaning to try zucchini pasta but when I buy zucchini the girls beg me to make zucchini bread. I need to get my stuff together and try it! I absolutely love the idea of veggie pasta, and I’ve even got some brussel sprouts growing in the garden. Do you love the Spiralizer you linked to? I’ve thought of buying one several times, but there were so many choices, and I wanted to make sure I get the right one. Did anyone actually make the recipe and have any comments / improvements? Be keen to hear before I try! Thanks!